1800: born in Edo. He is the son of the actor Ichikawa Aragorô I. 11th lunar month of 1805: he makes his first stage appearance, at the Kawarasakiza, receiving the name of Ichikawa Teruyo and playing in the drama "Chô Hanagata Koi Muko Genji". 11th lunar month of 1813: Teruyo becomes the disciple of Ichikawa Danjûrô VII, who gives him the name of Ichikawa Sanzô I. 11th lunar month of 1816: Ichikawa Sanzô I takes the name of Ichikawa Momotarô I at the Kawarasakiza, performing in the kaomise drama "Kiyomori Eiga no Utena", which also celebrates the shûmei of Ôtani Bajû II, Sôryô Jinroku II, Sakata Hanjûrô, Bandô Matajûrô III, Tsuuchi Monzaburô III and Ichikawa Kodanji III. 3rd lunar month of 1817: premiere at the Kawarasakiza of Tsuruya Nanboku IV's masterpiece "Sakura Hime Azuma Bunshô"; Momotarô plays the role of Yoshida no Matsuwakamaru [casting]. 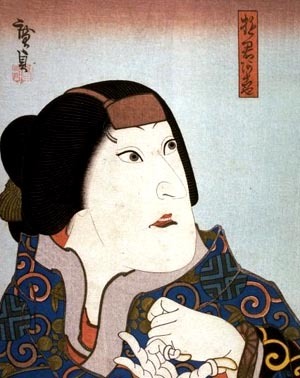 1825: Momotarô achieves a great success at the Ônishi no Shibai (Ôsaka) by playing the difficult role of Akoya in the drama "Dan no Ura Kabuto Gunki". 1828: tour in the Island of Shikoku, Shimonoseki and the Island of Kyûshû. 1831: he goes back to Ôsaka and takes the name of Ichikawa Hakuzô I. 11th lunar month of 1835: Hakuzô goes back to Edo after 11 years spent in Kamigata. He takes the name of Ichikawa Kuzô II at the Moritaza, playing in the drama "Hanayagura Kabuki no Jintori" (the long-forgotten name of Ichikawa Kuzô was first held by Ichikawa Danjûrô II from the 5th lunar month of 1697 to the 6th lunar month of 1704). 4th lunar month of 1836: premiere at the Moritaza of the drama "Hakkenden Uwasa no Takadono"; Kuzô plays the roles of Inukai Genpachi, Inusaka Keno, Horiuchi Kurando Sadayuki, Yamabayashi Fusahachi and the monk Hakuunbô [casting]. 7th lunar month of 1836: premiere at the Ichimuraza of the dance-drama "Shinobi Yoru Koi no Kusemono". The roles of Princess Takiyasha and Mitsukuni are played by Kuzô and Ichimura Uzaemon XII. 11th lunar month of 1838: premiere at the Ichimuraza of Nakamura Jûsuke IV's Tokiwazu-based dance "Hanabutai Kasumi no Saruhiki", commonly called "Utsubo Zaru"; Kuzô plays the role of the female lord [casting]. 3rd lunar month of 1840: premiere at the Kawarasakiza of the dance-drama "Kanjinchô"; Kuzô plays the role of Togashi [more details]. 3rd lunar month of 1842: Kuzô plays at the Kawarasakiza the role of Shigetada in the drama "Kagekiyo". His stage partners are Ichikawa Ebizô V (Kagekiyo) and Onoe Eizaburô III (Akoya). 1st lunar month of 1845: premiere at the Nakamuraza of Sakurada Jisuke III's dance-drama "Awa Mochi"; Kuzô plays the role of an awa mochi maker [more details]. 7th lunar month of 1852: premiere at the Kawarasakiza of Kawatake Shinshichi II's drama "Jiraiya Gôketsu Monogatari"; Kuzô plays the roles of Fûki Tarô, Yashagorô and Senso Dôjin [casting]. 8th lunar month of 1852: Kuzô is adopted by the widow of the actor Ichikawa Danzô V.
10th lunar month of 1852: Ichikawa Kuzô II takes the name of Ichikawa Danzô VI at the Kado no Shibai (Ôsaka), performing in the drama "Kin'ugyoku to Wakoku no Irifune". 1st lunar month of 1853: Danzô plays at the Kado no Shibai the role of Akoya in the drama "Kagekiyo". His stage partners are Ichikawa Ebizô V (Kagekiyo) and Kataoka Gadô II (Shigetada). 5th lunar month of 1854: Danzô plays for the first time the role of Shunkan in the drama "Heike Nyogo no Shima", which is staged at the Chikugo no Shibai (Ôsaka). His stage partners are Nakamura Tamashichi I (Chidori) and Arashi Rikaku II (Senoo Tarô). 4th lunar month of 1856: tour in Ise; Danzô plays for the second time the role of the exiled priest Shunkan in the drama "Heike Nyogo no Shima", which is staged at the Naka-no-Jizô no Shibai. His stage partners are Fujikawa Tomokichi III (Chidori) and Nakayama Ichizô (Senoo Jûrô). 6th lunar month of 1856: tour in Nagoya; Danzô plays for the third time the role of the exiled priest Shunkan in the drama "Heike Nyogo no Shima", which is staged at the Wakamiya no Shibai. His stage partners are the same as the 4th lunar month performance. 9th lunar month of 1856: Danzô goes back to Edo; he achieves a great success at the Nakamuraza by playing the roles of Akoya, Kagekiyo and Masayuki in the drama "Hatsuyuki Tomimasu no Kagekiyo". 5th lunar month of 1857: Danzô plays at the Moritaza the role of Otoku in the drama "Keisei Hangonkô"; the role of Matahei is played by Nakamura Fukusuke I. 6th ~ 7th lunar months of 1858: tour in Kôfu; Danzô plays for the fourth and last time the role of exiled priest Shunkan in the drama "Heike Nyogo no Shima", which is staged at the Kameyaza. 5th lunar month of 1859: Danzô plays at the Moritaza the role of Tsuribune Sabu in the drama "Zôho Natsu Matsuri Otoko Kagami". His stage partners in the roles of Danshichi Kurobê, Tokubê and Otatsu are Nakamura Fukusuke I, Ichikawa Kuzô III and Arashi Hinasuke VI. 1st lunar month of 1860: the 1762 puppet drama "Kishi no Himematsu Kutsuwa Kagami" (commonly called "Kishi Hime") is adapted for the first time to Kabuki, in Edo at the Moritaza; it is integrated within the new year sogamono "Momo Chidori Nigiwai Soga" and Danzô plays the role of Iihara Hyôe Suekage [casting]. 3rd lunar month of 1862: premiere at the Ichimuraza of Kawatake Shinshichi II's drama "Aoto Zôshi Hana no Nishikie" (commonly called "Shiranami Gonin Otoko"), in which Danzô plays the role of Kôbê [casting]. 8th lunar month of 1870: Danzô takes part in the performance of the classic "Kanadehon Chûshingura", co-produced by the Ichimuraza and the Nakamuraza. Fall 1870: Danzô goes on tour in Nagoya, performing at the Tachibana no Shibai. Then, he settles in Ôsaka and falls seriously ill.
10th lunar month of 1871: Danzô dies in Ôsaka. Ichikawa Danzô VI was a talented tachiyaku, who made a name for himself in Edo, Ôsaka and Kyôto (as did his two predecessors in the line). Able to play in both jidaimono and sewamono, he was particularly appreciated in wagoto or budôgoto roles. He was also able to play female roles, like Akoya in the drama "Dan no Ura Kabuto Gunki". He had the reputation to be reluctant to play extravagant roles and, just like Ichikawa Danzô V, gave importance to both realism and classicism in his way of acting. Ichikawa Danzô VI gathered eight roles popularized by Ichikawa Danzô I and Ichikawa Danzô II in a special collection called Kogeki no Hasshu. This long-forgotten collection includes the roles of Taira no Kagekiyo, Aoto Saemon and Ômori Hikoshichi.